Thousands of people from all over the World come to Salzburg every year to learn more about "The Sound of Music" and visit the sites where the famous movie was shot. Specialist tour operators organize trips to all the major sites in Salzburg, the surroundings and the Salzkammergut area. However, relatively few Salzburg tourists care about the actual "Sound of Music" story and the life of the Trapp family in this city. Recently, we received a letter by somebody who did care - and managed to find the real "Trapp villa", which is a private property and did not feature in "The Sound of Music", but is an attraction nonetheless. 2008 Update: The Trapp villa is turned into a hotel - for more on the story, read the article "Sound of Music Villa goes Hotel". 2009 Update: The Trapp villa is NOT getting turned into a hotel - because locals have resisted the enterprise due to the fear of increased bus traffic. Bastards. "Hello, my name is Jennifer I am an American from Miami Florida. I wanted to write to you in regards to some information about the "Sound of Music" on your website. On your site you write about other scenes were taken outside Salzburg and that the "real" Van Trapp Villa exists though, it did not feature in the movie and you have not figured out where it is yet. I wanted to let you know that I was a tourist in Salzburg around a year or two ago and I actually found and visited the "actual or real" (whatever you call it) house of Captain Van Trapp and his family. Unfortunately, I can not tell you exactly where it is. However, I know it is on the outskirts of the main city in a more rural location. I am not sure exactly however, it is either directly on or adjacent to Georg von Trapp Straße. Not far from the house, down the road (to the left if facing the house; away from the road you entered on) was a large field or a park with a church towards the back. If the field is to your left there are mountains to your right. I do though have some pictures of the house and me in front of the street sign, clearly displaying the name. Well, Jennifer was perfectly right - the villa is located in the Georg von Trapp Straße road and actually a well-known building with a beautiful garden in the rich district of Aigen in Salzburg′s south. In fact, it is not too far from the Fronburg on the other side of the river, which did feature as the von Trapp′s house in "The Sound of Music". 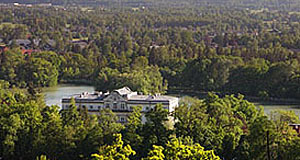 The actual Trapp villa was sold by the family in 1938, before they left Austria (aka Nazi-Germany) and left for the US. Thank you, Jennifer! If you are interested in "The Sound of Music" and the various locations that feature in the movie, read our article on the "Sound of Music Locations". You can visit most of them quite conveniently using public transportation.